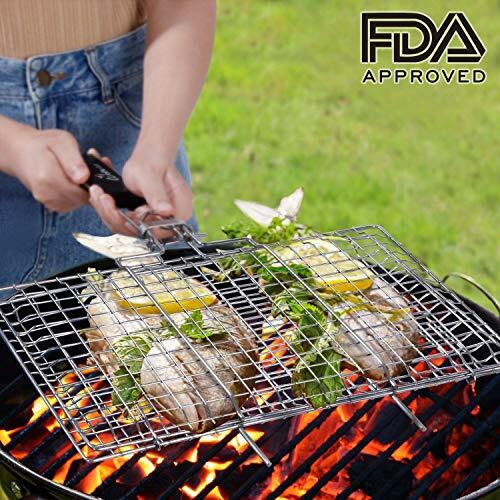 Are you struggling to prepare your veggies or fishes on your grill or smoker? Or tired using skewers or aluminum wraps? A vegetable or fish grilling basket can save you from these difficulties. Because when you directly cook your fish or vegetables on the grate, they can stick or fall from the grate. 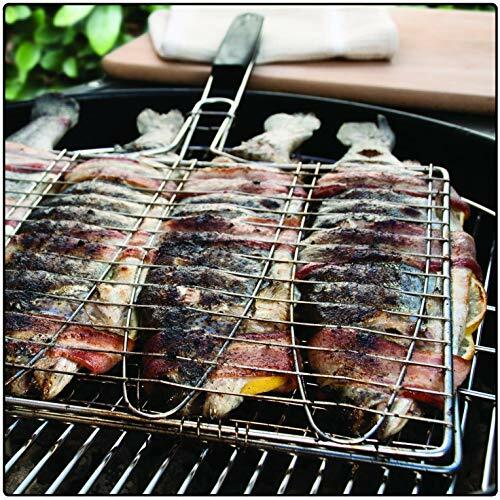 By using a grill basket, you can easily flip your fish or toss your vegetables. But it may be a little bit difficult to select the right one if you are a newbie or trying out something new. In this guide, you’ll find the key features for buying a perfect grilling basket and 10 best grilling basket which will make your selection process easier. 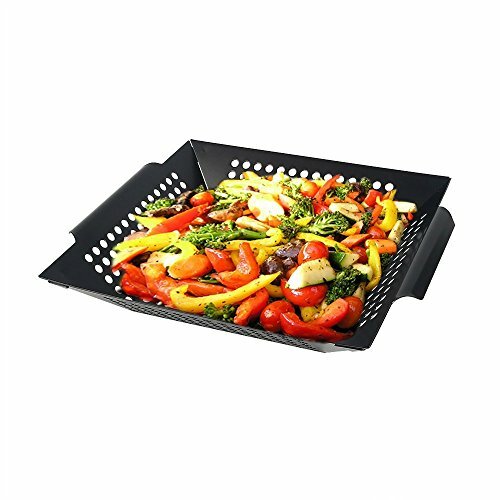 SMAID vegetable grill basket is durable and affordable option for stir frying chopped vegetables and shrimps. It is made with stainless steel and has holes all around it. It is a square shaped wok with rounded small handles. As per the instructions, I sprayed a good coat of cooking oil before tossing vegetables in it. The holes are perfect, not too big or small. Smoke flew through the holes upward ensuring even heating and the juices dripped down simultaneously. 13.1 x 11.6 inches area is enough to house fair amount of food and 3 inches high edges are convenient for stirring. This veg grill basket is dishwasher safe. It is convenient basket for feeding a large group. You get 4 kabob baskets with non stick coating in this set. There are latches on the lids to secure the food and rosewood handles are cool to turning the baskets. Kabob baskets are durably made with heavy-gauge steel. These baskets are great substitute of skewers and much safer. It can be used to grill vegetables as well. The only matter is, the gaps are too big for cut up veggies. So, either you have to use whole veggies in it or cut those in larger portions. I prepared shashlik using this kabob Grilling Basket. The lid was easy to lock and unlock. So, brushing sauce and oil was convenient. However, my heart broke when I realized considerable amount of chicken sticked to it. On the second trial, I sprayed tons of Pam on it and on the food before placing. This time food sticked lesser. The item may not as the advertisement mentioned, but it is still an useful tool within affordable range. From the title of the product, you now know that this product is got to be pro quality and reasonably priced, as it is manufactured by Weber. Your guess is right. Like all other products from Weber, this Professional Grade Vegetable Basket is made durable and long lasting. The unique feature of this grill wok is, it has tiny slits instead of holes all around it. The dimension is perfect to fit in any smoker and to cook meat on the grill along with the veggie basket together. Wondering, what could be the point of adding slits rather than holes on a vegetable basket? I got the answer after testing the sauteed veggies cooked in it. The slits add searing marks on the vegetables which you won’t get from other baskets. Besides, it creates different taste. To be honest, the price is high for a grill basket. But you get what you pay for. For me, it is reasonably priced, invest in it once and use for a lifetime. Slits create searing effect and unique taste. 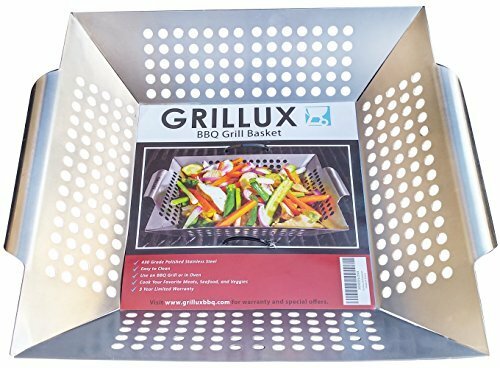 With the high end quality and the cheap price, vegetable grill basket from Grillux became unbeatable. 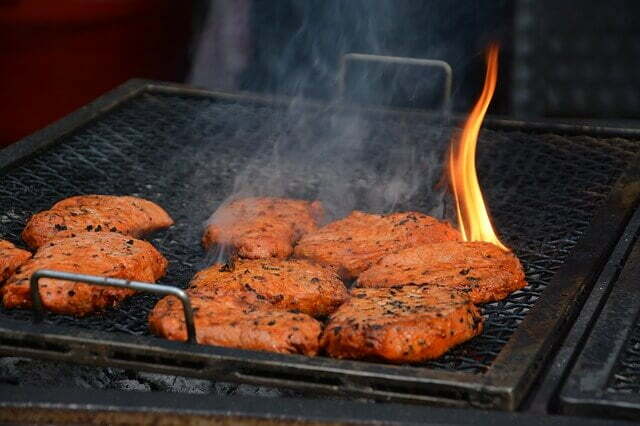 It is made from stainless Steel to survive the heat from any charcoal or gas grill. Like other conventional vegetable baskets, this one is also a perforated square basket with rounded handles. Lifetime warranty and the cheapest price makes it most popular. This basket most suit to use in campings, where you can use same cheap basket to cook vegetables and meat. When I finally got to use this basket, It seemed surprisingly heavier than I thought. Other users claimed it to be durable and long lasting too. So, you can definitely use it casually in the outdoor gatherings. Cleaning manually is easy and it is dishwasher safe too. The only problem is, its sharp edges are annoying. Be cautious while working or cleaning. A flat grilling pan or fish, a circular meat basket and a square vegetable basket are included in the package within affordable range. This set will be great for beginners who wants to master grilling skills without spending much. 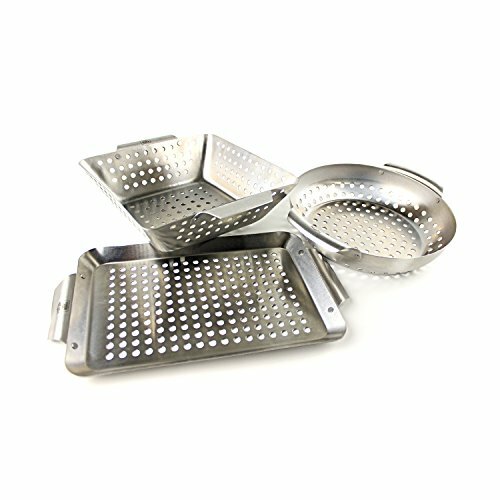 All these pan and baskets are made from stainless steel, are perforated and have rounded handles for easy grip. These are dishwasher proof as well. 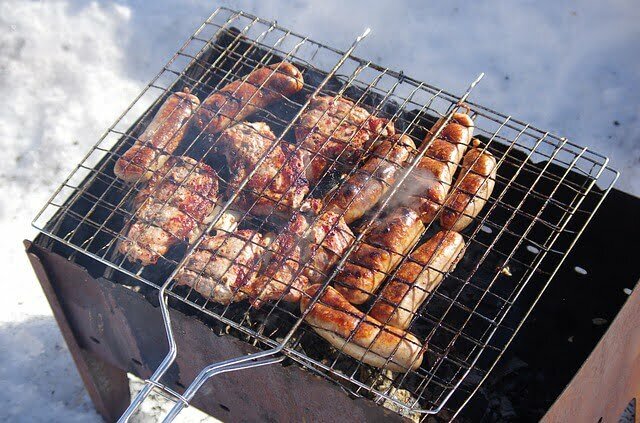 The baskets are feather-light to resist high temperature of any grill; this is what come to my mind at first appearance. However, we can’t expect miracle within low budget. Steering vegetables in the square basket was easy and smoked perfectly. Meats tend to stick a bit to the circular basket, but smoked properly as well. Problem arose while smoking fish in the flat pan. Fish skin sticked badly; it is more suitable for smoking fruits. Besides, the curved handles are too low to grab, those were touching the grates. Would be easier if handles were as flat as the flat pan. These baskets may not be long lasting, but within the price range there are perfect set of accessories for grilling. Attractive exchange and refund policy. The best feature of this fish grilling basket is, it is expandable! It has expandable slots as room to adjust with four 4 whole fishes of different sizes. In addition, it is handy for flipping sandwich, chicken, steak and even vegetables. Stainless steel makes it resistant to rust and corrosion. Handles are heat resistant and long enough to flip the basket with 4 fishes inside. 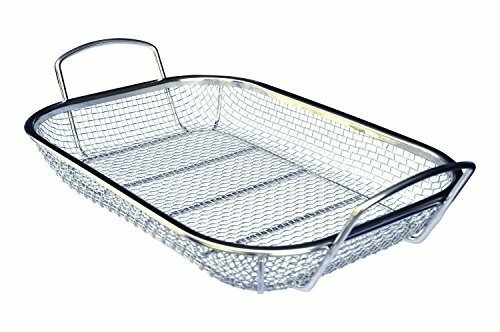 The advertisement presented it as trout BBQ Grill Basket but it is compatible to grill any freshwater whole fish of similar size and cut up fish of any size. I seasoned it well to make sure my fish do not stick, and it worked perfectly. It is made large to cook large amount of fish at once. So, it may take much room of your grill. Other than that, it is a must have if you are a smoked fish lover. The price is reasonable considering the pro quality. It can be a wise option if you are looking for a vegetable grill basket in non stick category. A little maintenance may make this high quality basket last four years. It has stainless steel under the non stick coating. Though It comes with long and convenient warranty offers, there are some limitations alongside its advantages. It is meant for gas grilling in temperature lower than 250℃ (482℉). To lengthen its life, it must be gently clean manually; no scrubbing, no dishwashers. If you started stressing about how to clean this basket after use without damaging the coating, then for your peace of mind, there was not much to clean after I used it. Food didn’t stick on it as I used it as instructed. So, cleaning with soapy sponge was enough. Beware, soaking overnight will rust the basket. About the price, it is not overpriced, keeping in mind its qualities. By the look of it you can tell it is unique than other vegetable basket. This basket from Culina has larger dimension, rounded off edges, and lifted handles; all together make this basket more convenient to hold, put significant veggies and steer easily. Unlike other perforated woks, this basket is designed to grill veggies on direct fire, as the best replacement of skewers and much safer. It is sturdy but lightweight. By the size of it, I realized, this vegetable basket will not fit small grills. But the good point is, in this you can smoke a lot more vegetables compared to conventional square baskets. The handles are made sensible, I gripped on those even with my mittens on. The basket grills perfectly and evenly. I can guess from its weight, it may not be as durable as advertised. Culina’s basket is easy to manual clean and dishwasher safe. You can cook two times more vegetables by the price of one. May not be Heavy duty as advertised. Its adjustable height is the most attractive feature. It lets you put large fish, chicken halves or even vegetables in it securely. Dimension is large, enough to keep food of up to 4 people and it is suitable any grill. Its handle is detachable, to keep it cool while cooking. Though, the handles were not convenient for me. It would be more convenient if it was made from wood simply. Apart from this, this basket from Wolfwise is a life saver. Food of different thickness can be cooked in it. Flipping is easy too. Its lock seemed flimsy, but the basket is durable otherwise. Made from 430 Stainless Steel to ensure longevity. Affordable too. Bringing this home may save you from invest in separate baskets for fish, meat and veggies. Suitable for meat, fish and vegetable. It is a non sticky and affordable fish grilling basket. Large grilling surface and detachable long wooden handles are the unique features of this basket from YeeTeching. You can put any flat food in it for grilling from steak to sandwiches. For larger food, needs to cut up to fit in. The non sticky surface makes this basket a bit delicate to handle and requires proper maintenance. Do not put it in high, direct flame. The manufacturers claimed it to be dishwasher safe, but I recommend manual cleaning for better longevity. You get 2 brushes in the gift box packaging. The performance is also satisfactory. You get only a few non-stick fish grilling basket in market. This grilling basket has many features to worth trying for. Not suitable to place thick food, needs to be cut up. A grill basket is a wire basket made of large- weaved mesh. Generally, a grill basket consists of two pieces of wired mesh, attached with one side and a long handle on the other side. 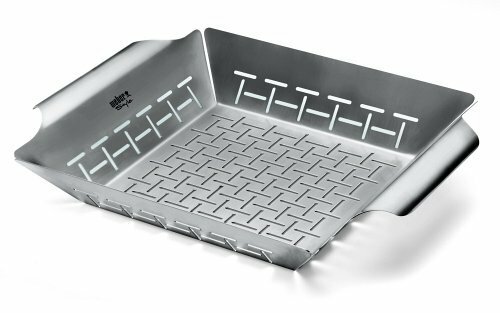 You can grill vegetables, seafood, fish or small pieces of meats in a grill basket. They are easy to use and you don’t have to be worried about falling down the small pieces of food into the flame. You can flip your vegetables at once by flipping the grill basket. Wok grill baskets are available in two shapes, round and square. Walls of these baskets are high so that you can easily flip, toss or stir them. These type of grill baskets are used to grill delicate item like fish. They have the flexible and strong center which helps to hold the food while flipping. Mesh grill baskets are a circular bowl with firm still cage wrapped around with steel mesh. They are used for small pieces of foods. Kebob grill baskets are long, thin, cubed steel cage with a long handle. Normally used to make kabobs faster and easily without any skewer. For purchasing a grill basket the first thing you need to keep in mind that the material should be durable and good quality. A good quality grilling basket can serve you for a long time without getting rust or twist or warp. If you prefer a non- stick basket, select the one with FDA approved non stick coating. Your basket should be big enough to contain an appropriate amount of food. But you need to remember, it must fit the size of your grill. To get the perfect size, you can measure your grill before selecting the basket. High walls of a basket allows you to grill a lot of veggies in it. Besides, you will have enough room for stirring and tossing your vegetables and it won’t let them fall into the flaming coal. The handles of the grilling basket should be wide enough. You will be able to lift it comfortably with your heat resistance gloves. 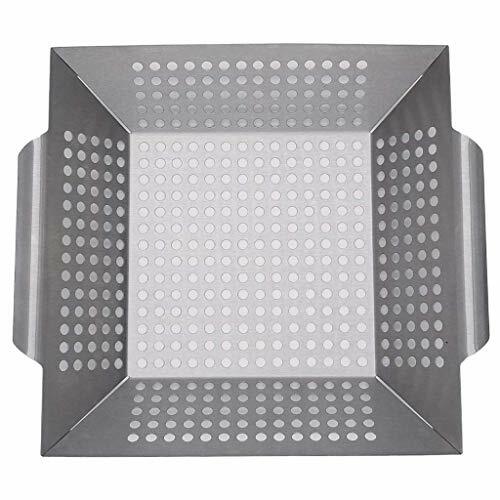 Before purchasing, you need to make sure that the dimension of the basket is compatible with your grill or smoker. Because some company provides the measurement of the basket only. It would be great if the handles are removable. The holes of the basket have to be big enough to let the marinate drain and small enough to prevent the food from falling while tossing. Must check the basket is smooth and have no burr and sharp edges. Because burr and sharp, unfiled edges may cut your finger while cleaning. Among the different types of materials, stainless steel baskets are dishwasher safe. Even some non- stick, durable, scratch resistance and porcelain enamel coatings are also dishwasher safe. If your basket is not dishwasher safe, it should be hand washed easily. Only you need to be careful about not to scrap the nonstick coating. Mesh grill baskets are hard to clean as foods love to stick to them. But you can clean them easily with a scrubbing brush. Select the basket that can handle the high temperature. This type of grilling basket will last long. Your shiny grill basket may lose its beautiful look after repeated use. Lots of effort will be needed to keep them as new. On the other hand, black coated basket won’t change its appearance. Though a good quality basket will last for a long time, you can’t use them for a lifetime. So before purchasing you must consider your budget with the quality. If your grill basket doesn’t have non- stick coating, must grease it before using. It will prevent food from sticking. You can also preheat the basket for a few minutes. It will also prevent your food from sticking. Clean your grilling basket thoroughly with soap and water after every use. Avoid using a steel wool to clean a non- stick basket, it will ruin your grill basket by scraping off the finishing. Store your grilling basket away from wet or moisturized place. It will protect them from getting rust. A grill basket can make your cooking more manageable. 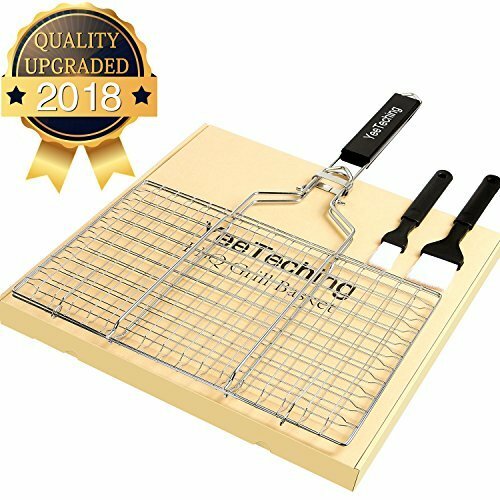 You can select wok or mesh grill basket for vegetables, easy flip clam grill basket for fishes and kabob grill basket for making any kind of kebobs. And of course look for the mentioned key features, these can help you to find the perfect one. Stainless steel or non- stick coated one can be the right selection as they are easy to use and maintain. So, which one you prefer and why? Please let us know about your experience.